West End:- Purple Emperor butterfly seen in oak tree to right of viewing area. 9 Common Terns, 1 Little Egret, 3 Mandarin, 2 Buzzards. 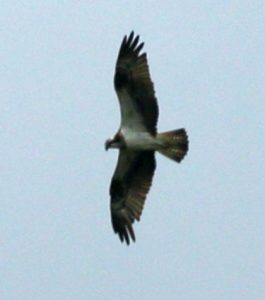 West End:- We watched an Osprey from about 2.30 until 5.00 pm It didn’t catch a fish but gave some lovely views. 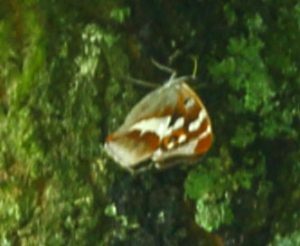 There were 2 Red Admirals and a beautiful PURPLE EMPEROR butterfly feeding on an oak tree, for at least 10 mins. They were on the oak behind the metal feed station pole. It was a first for myself and for most of the 6 people with me. West End:- These are both noteworthy species at this site. the right hand bird feeder. Dam End:- 2 Little Egrets, 2 Common Sandpipers, 7 Greylag Geese, 1 Lapwing, 150 Black-headed Gulls, 1 Herring Gull, 7 Common Terns including a Juvenile, 22 Pied Wagtails, 1 Grey Wagtail, 1 Kestrel, 11 Swifts, 24 House Martins, 4 Swallows, 1 Chiffchaff, 1 Common Whitethroat, 3 Green Woodpeckers, 11 Mallard. 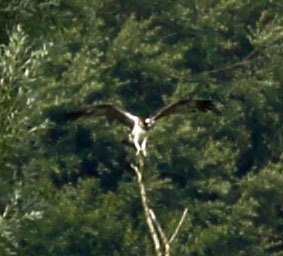 West end:- Between 16:00 and about 16:30 an Osprey was seen hunting by me and several other people. It attempted a couple of times to take a fish but failed. Eventually it was lost from site and probably went towards Admiral’s Wood. It may have been the same bird seen on Sunday. Also 1 Little Egret, 1 Buzzard, 1 Kestrel, 2 Common Tern, 5 young Great Crested Grebe. Reservoir totals for West End and Dam End:- 55+6 young Great Crested Grebe, 22 Cormorant, 7 Little Egret, 8 Grey Heron, 9 Greylag Geese, 4 + 2 Young Mandarin, 24 Mallard, 1 Buzzard, 1 Kestrel, 6 Moorhen, 5 Lapwing, 1 Common Sandpiper, 96 Black-headed Gull, 2 Herring Gull, 6 Common Tern, 2 Stock Dove, 1 Grey Wagtail, 1 Pied Wagtail, 3 House Martin, 1 Blackcap, 2 Chiffchaff, 6 Goldfinch, 1 Reed Bunting. Whillet’s:- 1 Great Spotted Woodpecker, 4 Swallow, Song Thrush & Reed Warbler heard, 3 Whitethroat, 1 Treecreeper, 2 Bullfinch. West End:- Frank & Val Sugg and Mark Dunkerley watched an Osprey catch a fish around 11:15AM; it flew towards Admirals Wood with its food. They also saw a Great Spotted Woodpecker at the Car Park and Lapwing on Pintail Bank. West End:- 55 + 6 young Great Crested Grebe, 15 Cormorant, 3 Grey Heron, 1F Mandarin with 2 small chicks + 2 more adults, 2 Moorhen, 1 Kestrel, 1 Common Sandpiper, 5 Common Tern. Whillet’s:- Reed Warbler & Bullfinch heard. 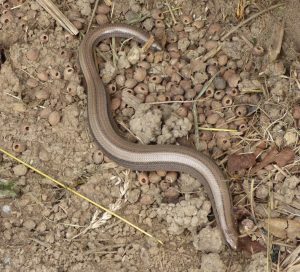 Also 1 Slow Worm (see pic). West End:- 1 Common Sandpiper, 1 Little Egret, 1 Tufted Duck, 1 Lapwing, 30 Greylag Geese, 2 Mute Swans, 49 Great Crested Grebes + 5 young, 2 Grey Herons, 12 Cormarants, 1 Mallard, 3 Black-headed Gulls, 4 Common Buzzards including 2 juveniles, 1 Sand Martin. Whillets:- 1 Reed Warbler, 1 Reed Bunting, 1 Blackcap, 1 Whitethroat, 1 male Emerald Damselfly, 2 male Blue-Tailed Damselflys, 3 Brown Hawkers, 1 Emperor Dragonfly. Dam End :- 3 Little Egrets, 2 Common Sandpipers, 6 Common Terns, 4 Herring Gulls, 65 Black-headed Gulls, 1 Lapwing, 3 Pied Wagtails, 24 Canada Geese, 1 Greylag Goose, 3 Grey Herons, 2 Chiffchaff, 1 Blackcap, 1 Green Woodpecker, 17 House Martins. Dam End:- 1 Common Sandpiper, 38 Pied Wagtails, 1 Grey Wagtail, 5 Common Terns, 112 Black-headed Gulls, 1 Herring Gull, 2 Grey Herons.